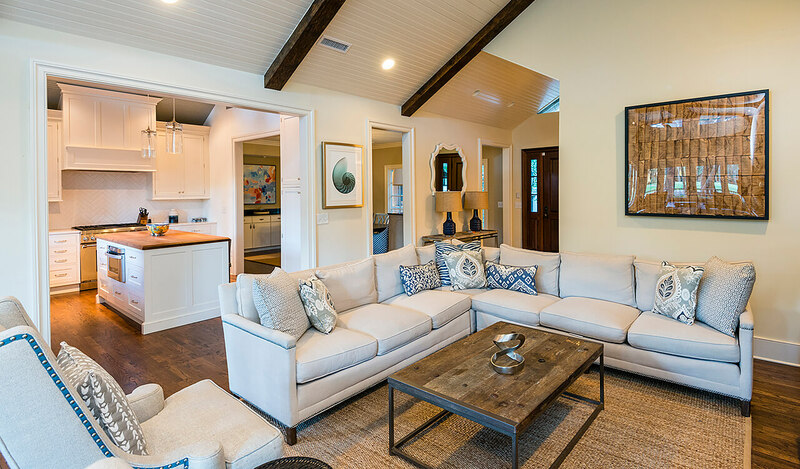 Fully renovated and expanded by Walkley-Bennett in 2014 and professionally decorated by Melanie King Designs, the exquisite coastal home at 301 Surfsong Road offers pristine one-level living and lush golf views. 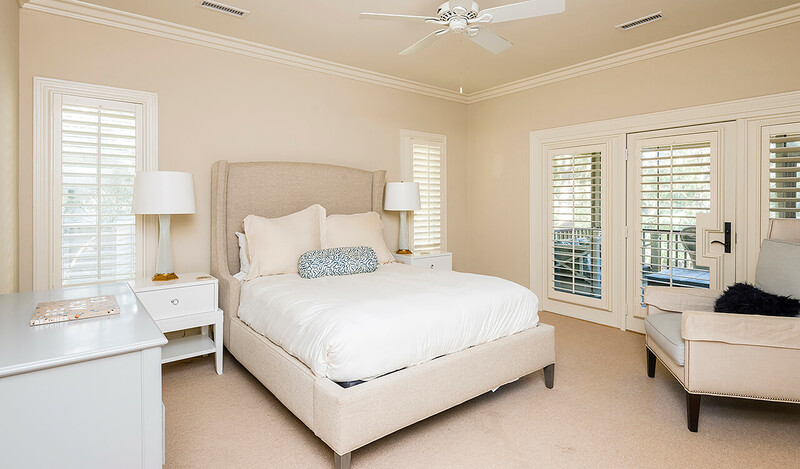 Nestled on a beautifully landscaped homesite bordering hole no. 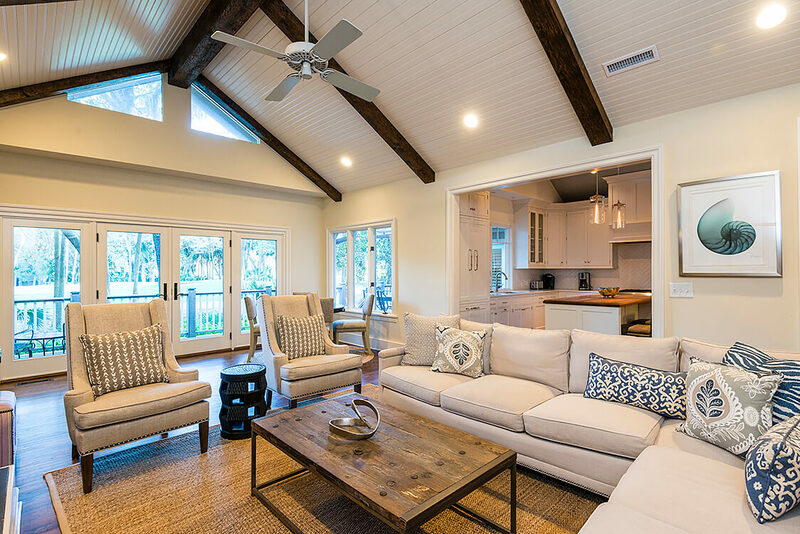 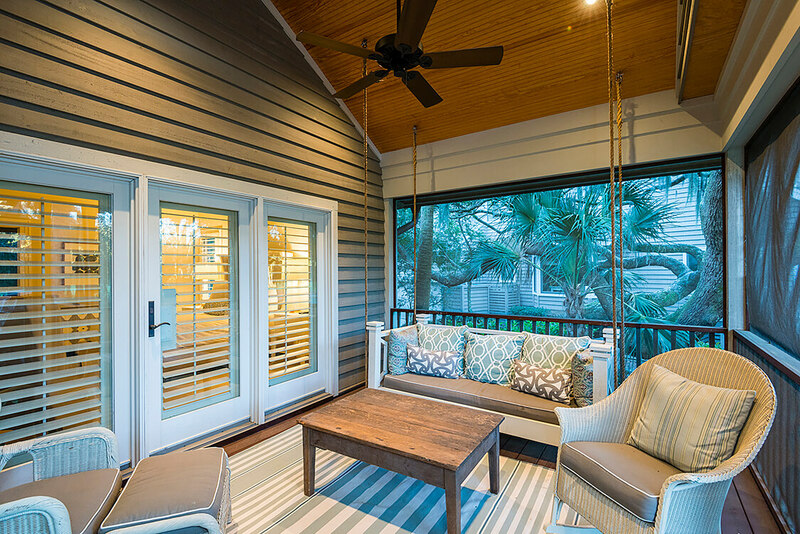 10 of the Jack Nicklaus-designed Turtle Point golf course, just a two-minute bicycle ride from the beach, this home’s spacious open floor plan—with three additional bedrooms, a new gourmet kitchen, and screened porch added during the renovation—makes it an ideal family beach home. 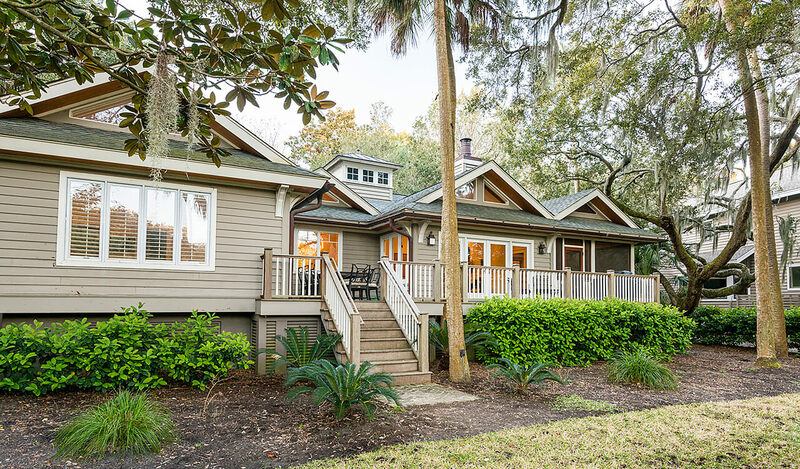 Outside, the home enjoys an abundance of curb appeal with its cross gabled roof, dormer windows, wooden carriage-style garage doors, copper gutters, and wrought iron gate shaded by native oaks and palmetto trees. 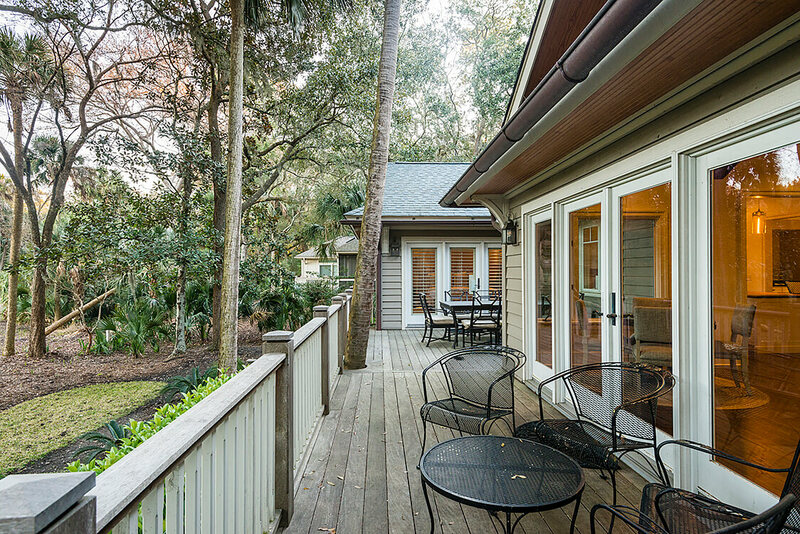 There’s a turnaround space in the graceful drive, and stairs of Charleston brick lead up to a covered porch beside a private courtyard. 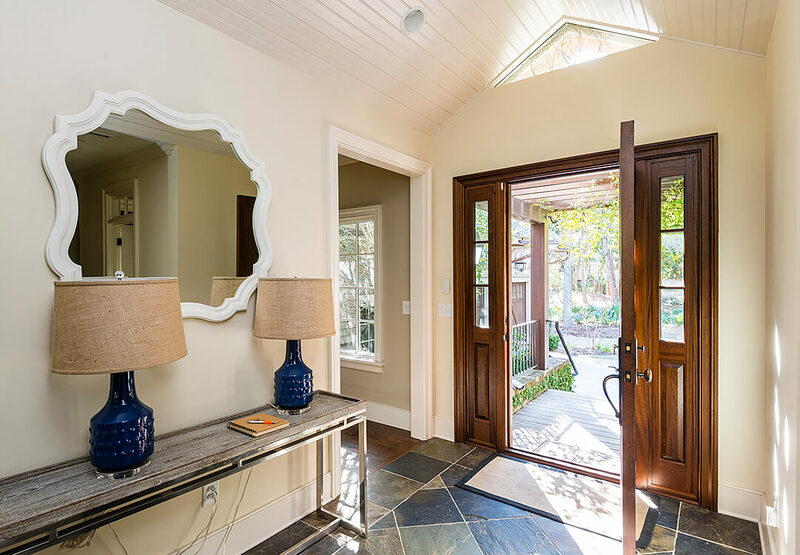 Inside a mahogany entry door flanked by sidelights, the slate-floored foyer is lit from above by a window tucked just beneath the vaulted shiplap ceiling. 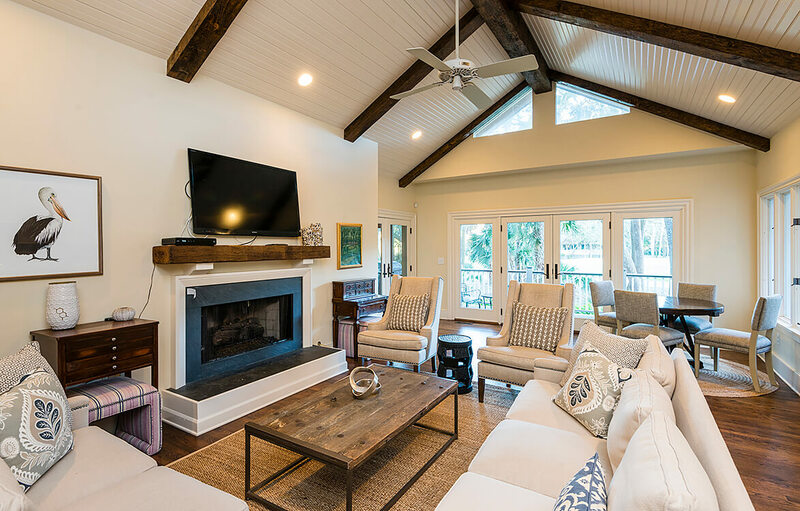 It opens into a stunning living room with its two-story vaulted shiplap ceiling accented by exposed hand-hewn wooden beams, a fireplace with slate surround, wide-plank hardwood flooring, and two stories of windows and glass doors showcasing views of the golf course and opening to a broad sundeck. 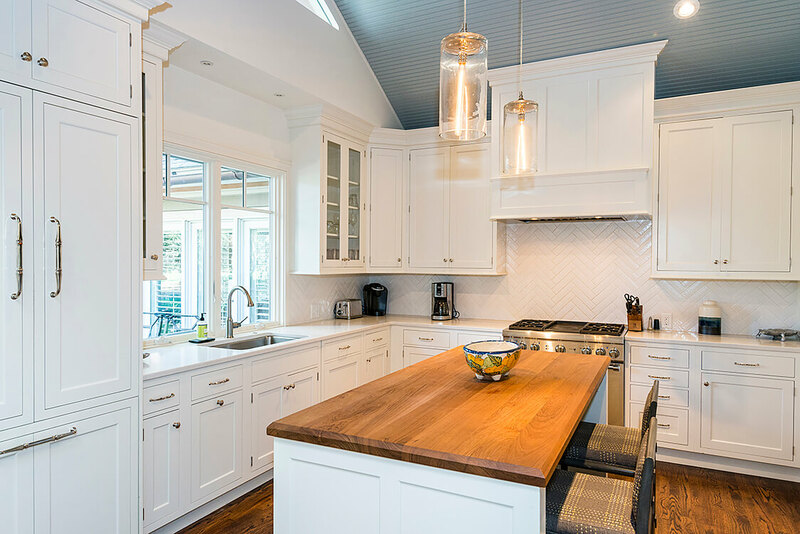 To one side, a wide, cased opening frames an immaculate gourmet kitchen with a striking vaulted ceiling of beadboard painted in a deep coastal blue, teak-topped center island, clean white Shaker and glass-fronted cabinetry, quartz perimeter counters, and pristine glazed tile backsplash set in a herringbone pattern. 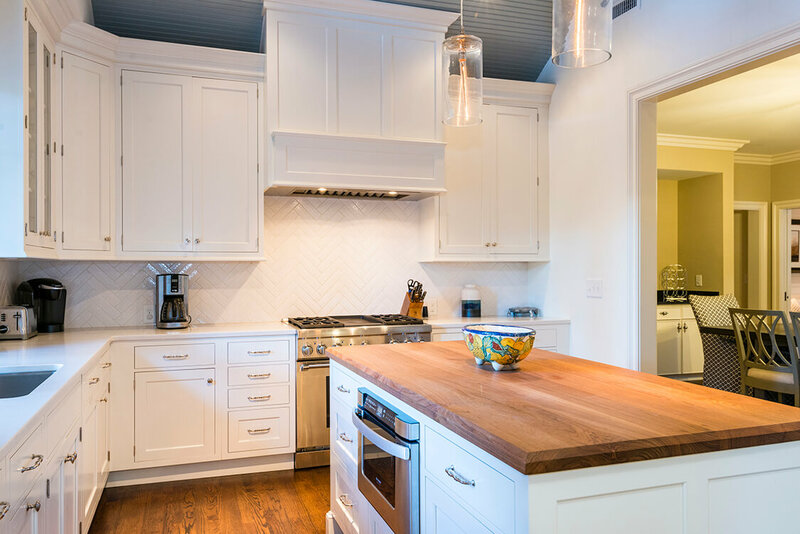 Professional-grade appliances include a Thermador® four-burner gas cooktop and range, stainless-steel microwave drawer set into the island, Bosch® dishwasher, and Thermador refrigerator paneled to match the cabinetry. 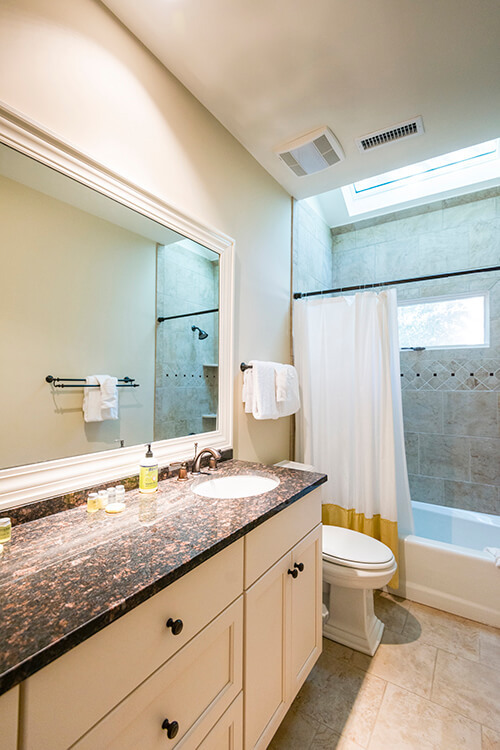 Sunny windows above a wide-basin sink overlook the sundeck and golf course. 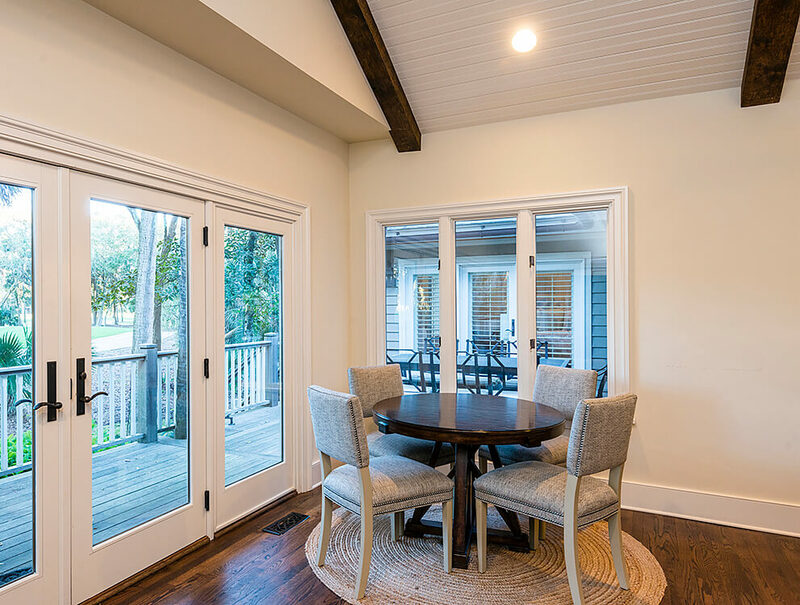 Beside the kitchen, a spacious dining room with lovely white trim and crown molding enjoys lush views as well from a row of windows. 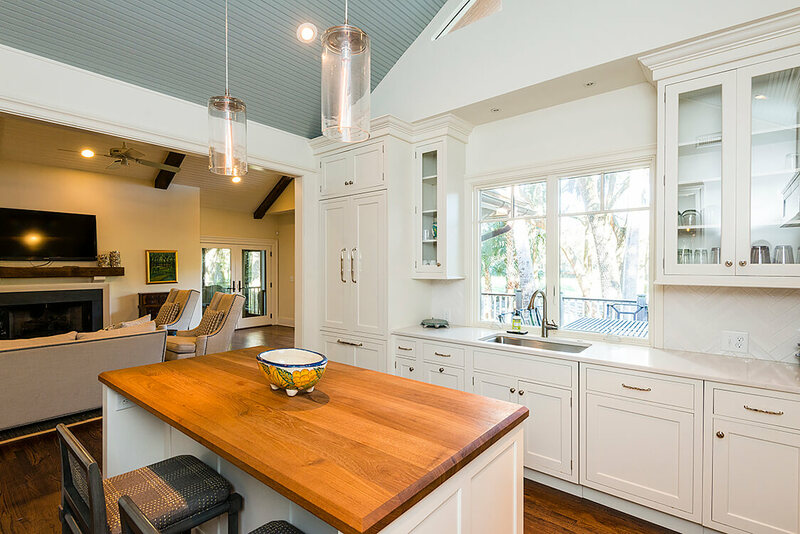 Tucked into a wide niche is a wet bar, and there’s easily space for ten to dine. 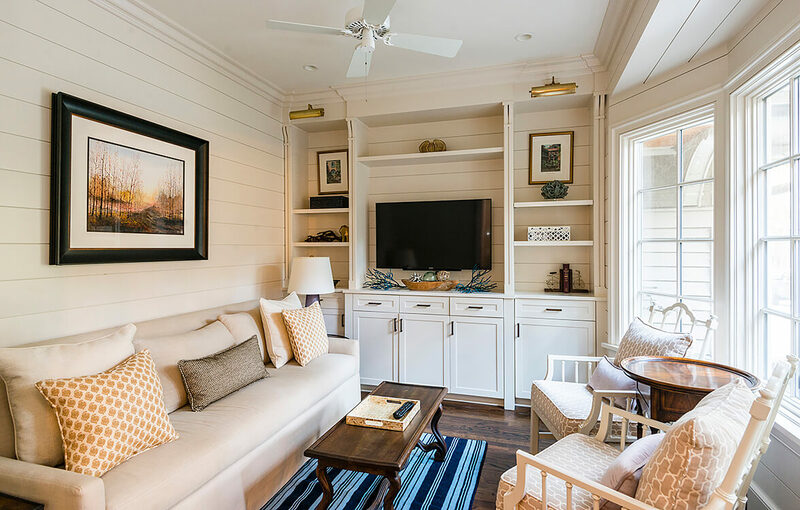 An adjacent study with white shiplap walls, pocket doors, and a sunny bay window overlooking the courtyard offers an additional sitting area. 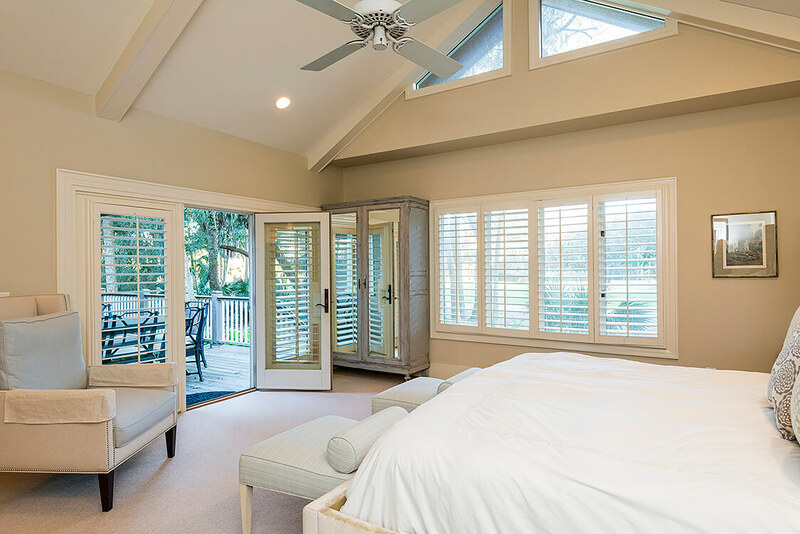 The first-floor master suite is both serene and breathtaking, with a vaulted ceiling accented with pale beams, two stories of windows framing the verdant views, and glass doors opening to the sundeck. 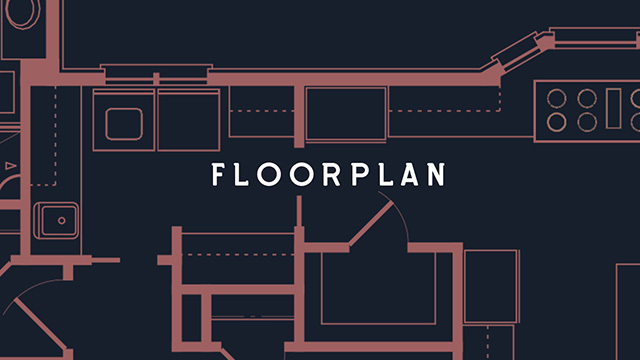 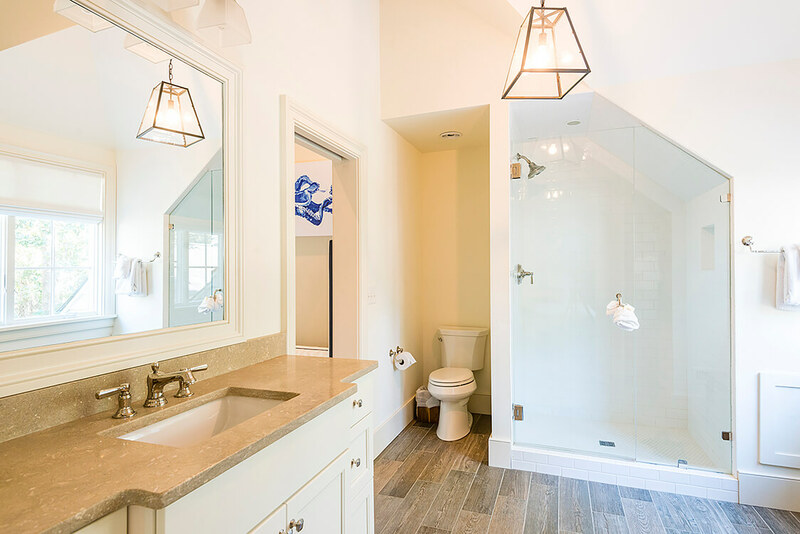 The ceiling is vaulted in the pale, stone-appointed bath as well, where skylights and plantation-shuttered windows over the soaking tub fill the space with natural light. 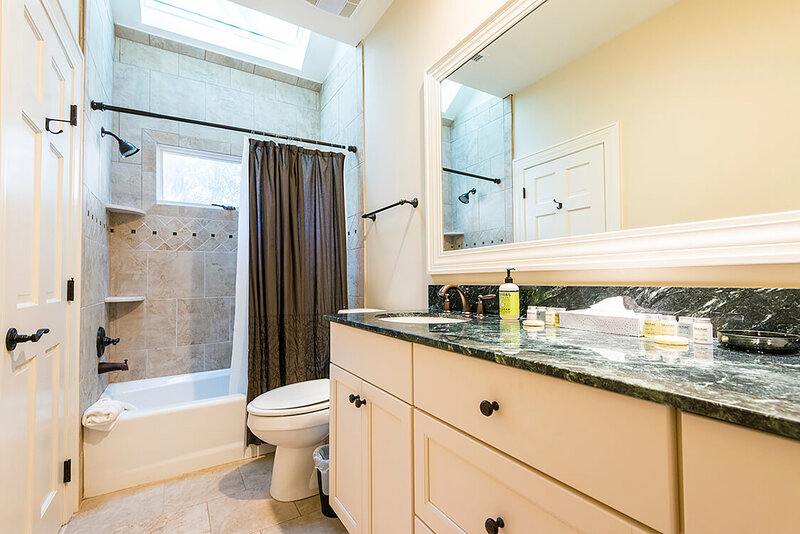 His-and-hers sinks are set into a granite-topped vanity, and the frameless-glass shower with rainhead is beautifully tiled. 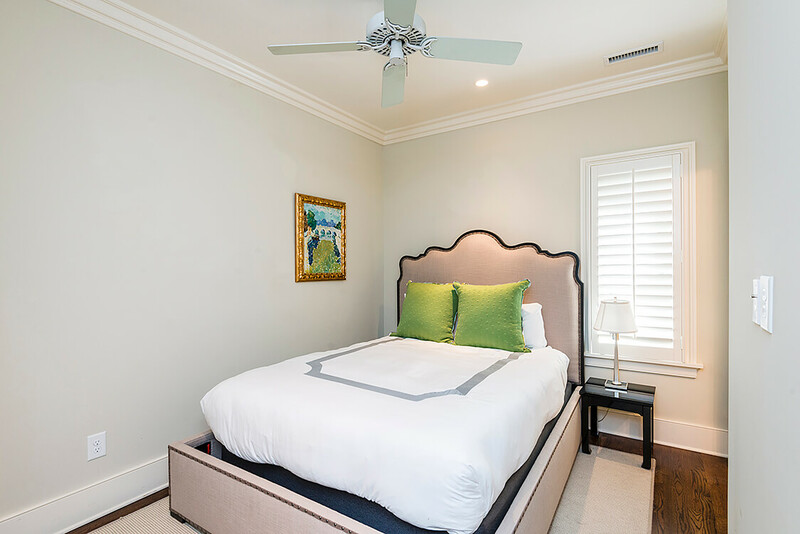 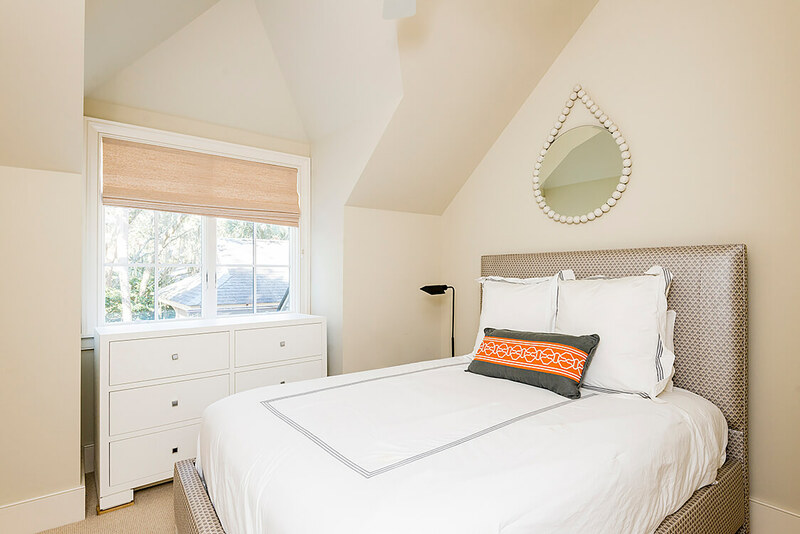 A second master suite, its bedroom airy and light with a high ceiling and glass doors opening to a generously sized screened porch lies in the opposite wing, and two en suite guest bedrooms complete the level. 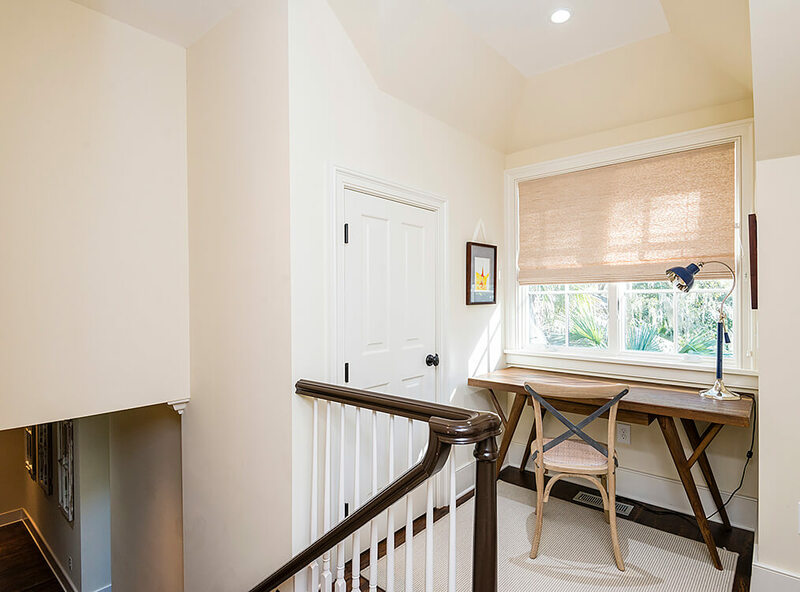 Stairs lead up to additional guest quarters over the garage. 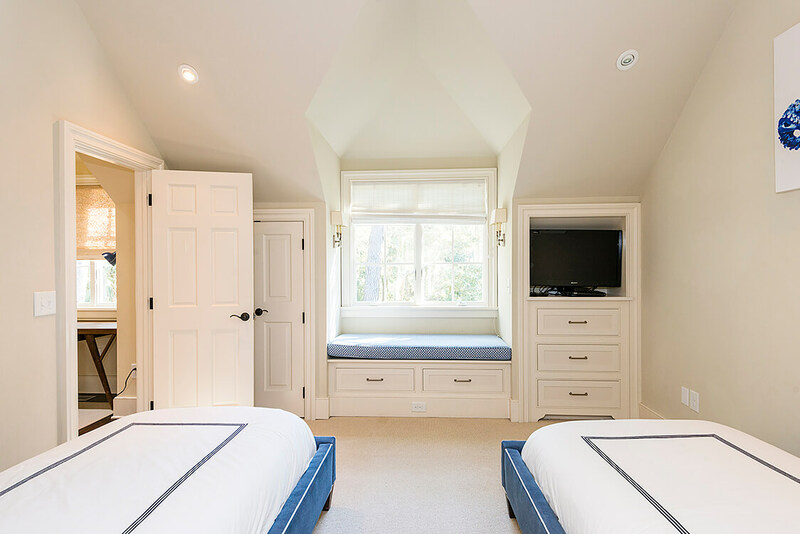 A bright office niche overlooks the lush treetops to the side of the property, and the bedrooms, one of which features white custom cabinetry and a built-in window seat, are filled with sunlight from dormer windows below vaulted ceilings. 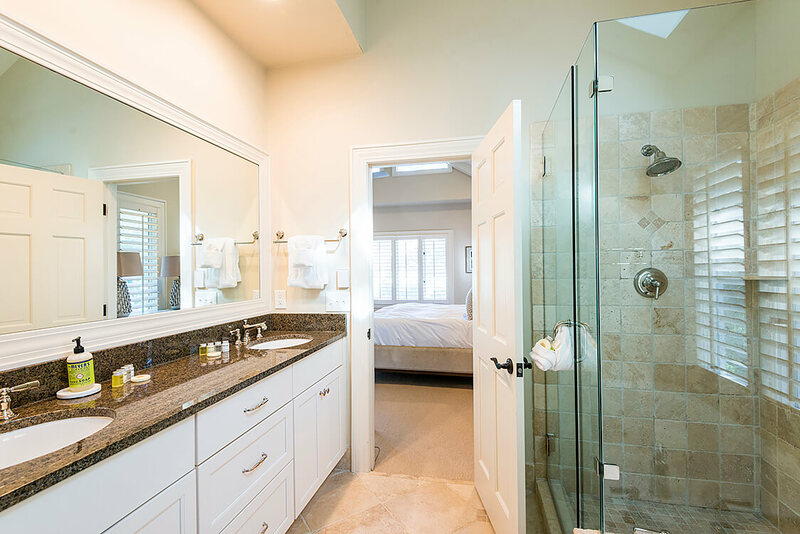 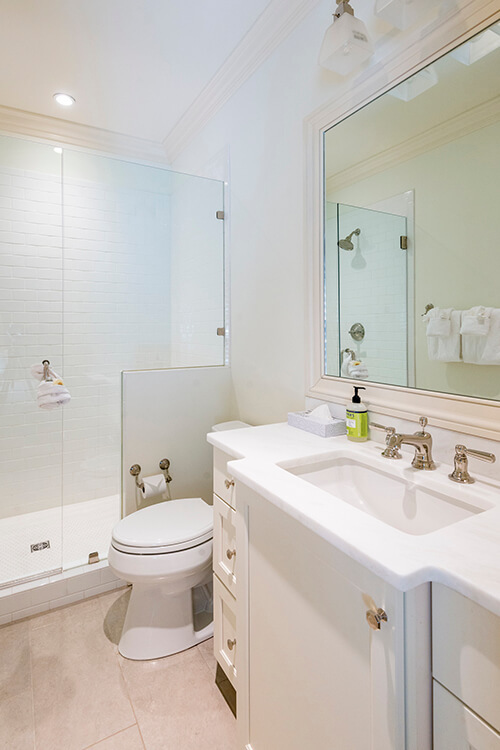 A gorgeous white bath with wood-plank ceramic tile and walk-in shower adjoins both. 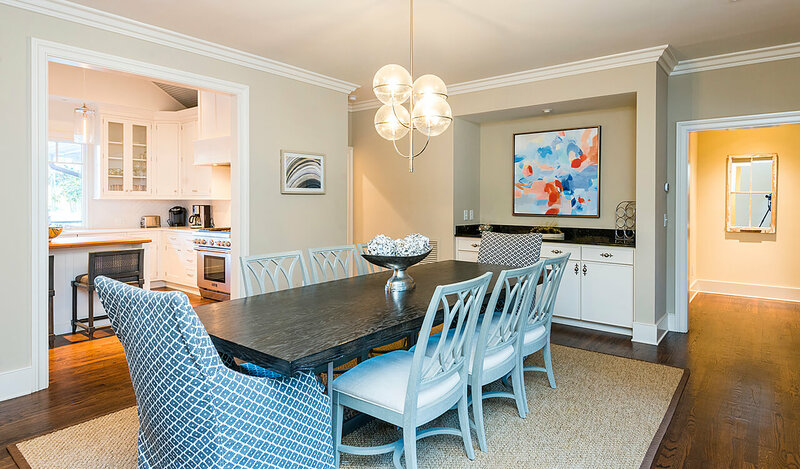 Additional features of this immaculate home include a first-floor laundry room, tankless water heater, irrigation system, 588-square-foot garage with epoxy flooring and built-ins for storage, and superior rental potential. 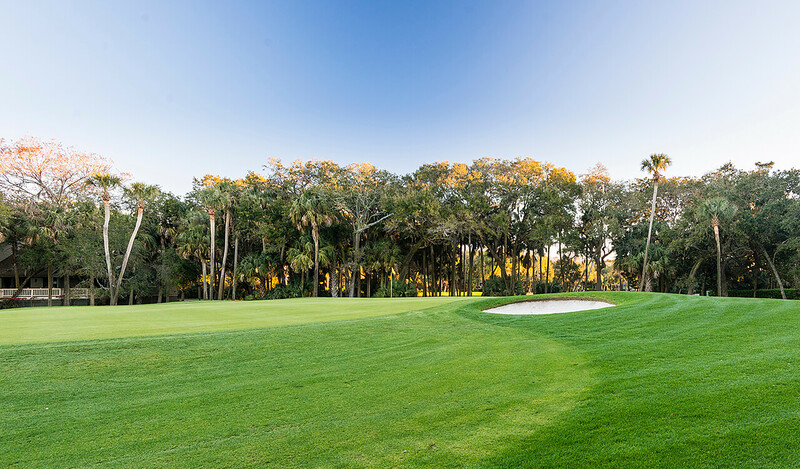 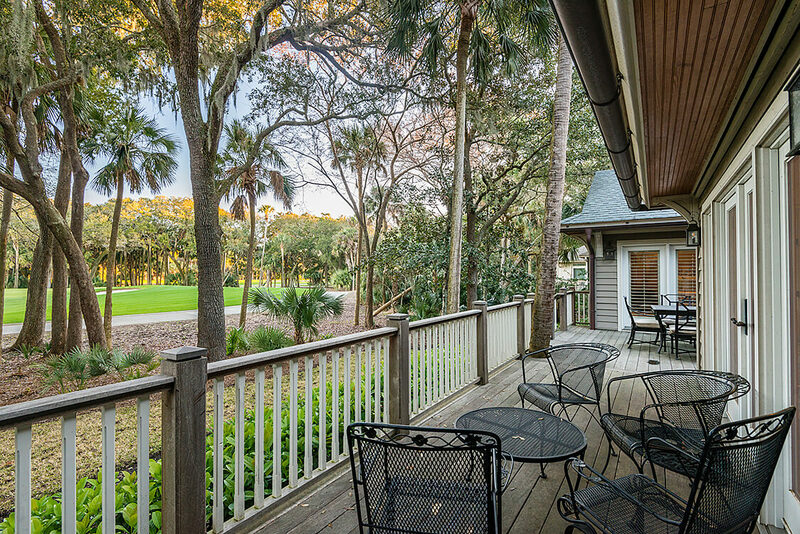 A Kiawah Island Club Social Membership is available with the purchase of this property.